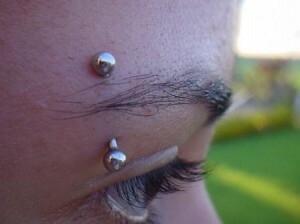 Eyebrow piercings are one of the more fashionable and trendy types of body piercing. As a statement of grandeur and exquisiteness, this piercing style is adorned by individuals from all works and spheres of life. It’s not surprising to see male and females adorning the same type of eyebrow piercings, in fact among body art enthusiasts; eyebrow piercings are regarded as universal/unisex. The only noticeable differentiation among the sexes is that women tend to use more colorful versions of eyebrow jewelry. Unlike like other forms of facial piercings, eyebrow piercings have been in vogue since time immemorial. They were a signature style statement in the punk era of the 1960’s through to the 1970’s and well into the 21st century, over time the popularity of this piercing trend has only continued to wane stronger. And for good reasons too; not only is it a relatively easy and convenient piercing to effectuate, but eyebrow piercings are also known to imprint an air of confidence and youthful exuberance on the face of the wearer, making them choice piercing style for every fashionista looking to add a touch of youthfulness to their look. The piercing path in a horizontal eyebrow piercing follows the natural outline of the eyebrow, usually above it, sometimes by its side. Vertical eyebrow piercings pass right through the eyebrow, from its upper margin to its lower margin or vice versa. Because they inflict considerable trauma to the eyebrow, these form of eyebrow piercing takes longer to heal and is also prone to rejection. That said, individuals who rock vertical eyebrow piercings are known for their characteristically sophisticated look. 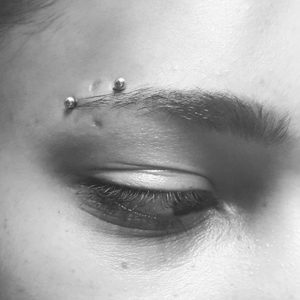 As the name implies, a double eyebrow piercing features two eyebrow piercings with their accompanying jewelry on a single eyebrow. Double eyebrow piercings are common among female folk, and is revered for the chic look it affords the user. 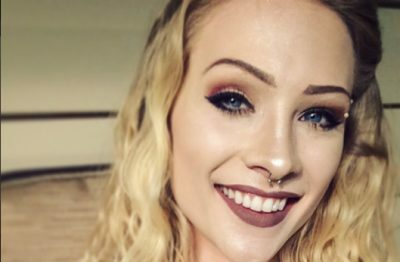 While the list of body jewelry compatible with eyebrow piercings is practically endless, eyebrow rings stand out as the most alluring and unique of them all. For many body artists and professionals, eyebrow rings are the recommended body jewelry for eyebrow piercings. They come in different shape and sizes; each bearing design features that appeal to a particular set of body Jewelry enthusiasts. One thing to note, the Eyebrow region is a particularly sensitive area, as such, always endeavor to go for high-quality eyebrow rings (or any other eyebrow jewelry for that matter). Cheap body jewelry sourced from places like grocery stores are manufactured from inferior materials known to induce irritation and sometimes infections. Premium eyebrow jewelry is usually made of either surgical grade stainless steel, high-quality gold, titanium, etc. One way to ensure you are getting high-quality body jewelry is to shop at a reputable body jewelry store, either online or at a conventional brick and mortar retail outlet.